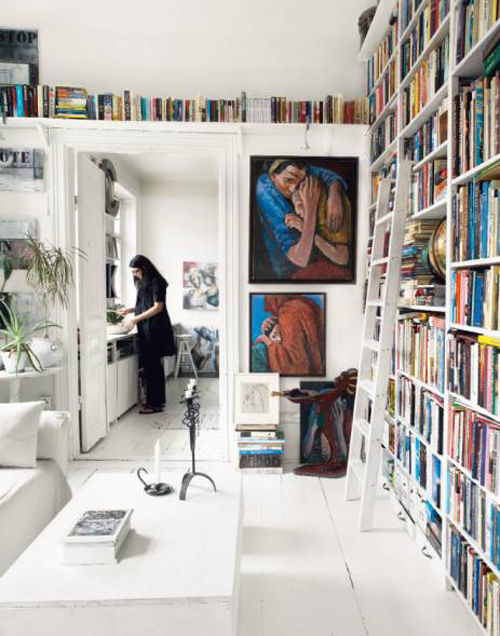 This Swedish home was featured in a last year’s edition of Swedish magazine Skona Hem. Owner Carola has the art to collect this without making the place feel to cluttered. On a wall in the living room are paintings of loved ones. This unique collection gives a lot of character to the room. The living room is covered with an open bookcase which stretches up to the ceiling. The paintings are made by Carola’s uncle, Peo Rosen. The bedroom is small and has now windows but a cozy atmosphere is created by using white and natural colours. In the long, narrow hallway (top right & below right) different collections of frames, hats and glasses can be found. 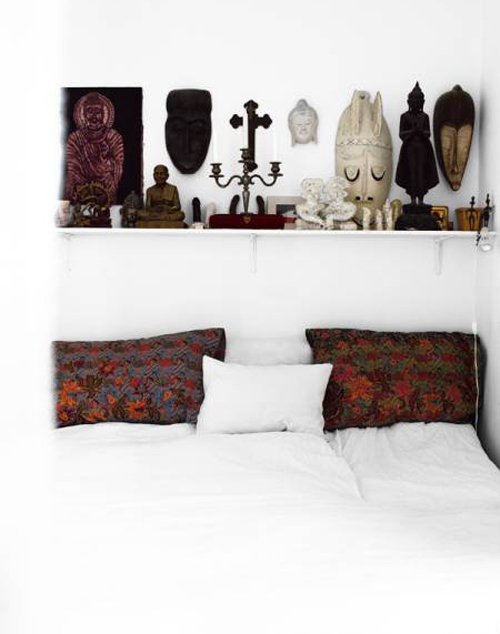 Now seeing this image of the bedroom i might want to get my Budhas back from the attick! I love the approach to decorating this home. In almost a gallery setting, art is seen from floor to ceiling…reminds me of Gertrude Stein’s atelier in Paris. I’m fascinated by this home and also lusting after the wall of shoes! She has achieved this perfect balance of having a lot of “things” and collections on display without having the place look cluttered. Thank you for sharing! her entire wall is art. i love that! I love the picture wall and book collection in the first two images! Maybe a bit too muchy stuff for my taste, but it looks very organized and everything is displayed in a very stylish way. loved the wall art and how the furniture pops off the white walls and floor. Really great!! Love that she has tons of gorgeous stuff but the beautiful order and display mean that it isn’t cluttered! Want those bookshelves! 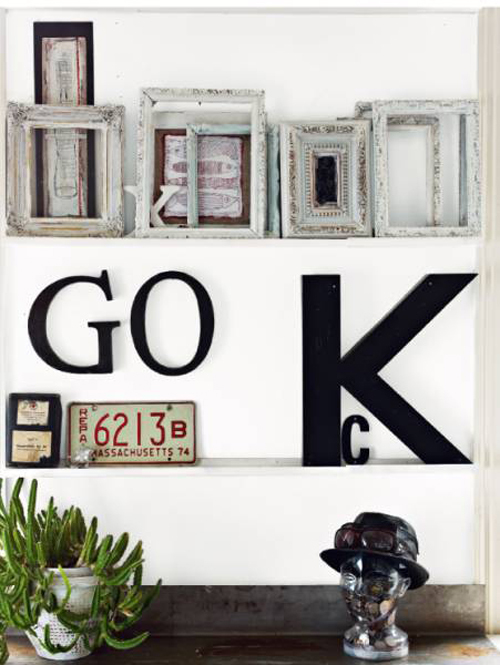 I never tire of gorgeous groupings of frames! ridiculous. i love love love it.